If this were the mid-’90s, and I told you virtual reality experiences in the future would be sophisticated enough to convincingly take you into worlds unknown, you probably would have laughed at me. At that time, the Virtual Boy was the only VR headset on the market, and it didn’t offer anything close to what’s possible today. While we’re not in the Star Trek age of Holosuites and Holodecks yet, we’re getting closer each year. Thanks to recent advancements in displays, graphics horsepower, and low-latency positional tracking, the VR experiences now available for the Oculus Rift and HTC Vive are immersive and realistic. You can don a headset, pick up a pair of controllers, and feel like you’re conjuring magic, gunning down enemies, or visiting the bottom of the ocean. These experiences are accessible to regular gamers, too. 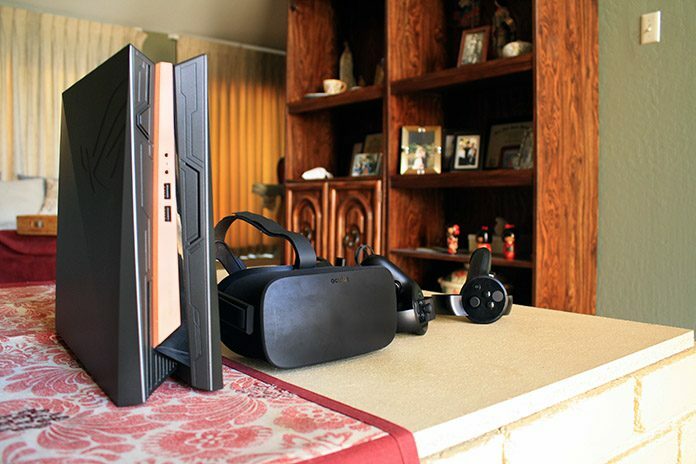 The discounted Oculus Rift makes delving into VR more affordable, and the required system specs are reasonable enough that mid-range machines like the ROG GR8 II measure up. We’ve tested this small-form-factor gaming PC in traditional games, and now it’s time to explore VR. 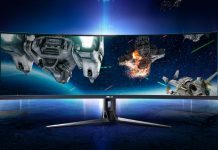 Before you start dabbling in virtual reality, you need to ask yourself, “Can my computer keep up?” Frame rates are crucial; your computer has to consistently render new frames in 11ms or less in order to keep pace with the headset’s 90Hz refresh rate. If it can’t render a new frame in time, you may experience judder due to a dropped frame. 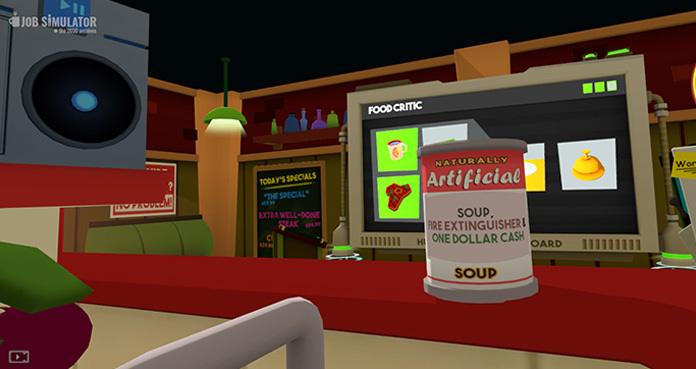 Judder is the bane of any VR experience. PC gamers have probably seen a similar effect with frame stuttering on a monitor. Now imagine that impacting the whole world around you instead of just the screen in front of you. Encountering judder makes you more likely to experience motion sickness, which may lead to you to a need to take frequent breaks (or worse, look for the nearest bathroom). Modern VR attempts to alleviate the issues caused by dropped frames by filling in the gaps with warped frames. Warping essentially fakes a new frame by combining the previous frame with trajectory collected from the headset. Sounds cool, right? Well, yes, but while warping can help counteract judder, it’s not a silver bullet. Depending on the scene, you may still notice visual peculiarities produced by synthesized frames. Your sensitivity will vary with the experience, but real frames are always preferable, ideally with no drops at all. You need at least a GeForce GTX 1050 Ti GPU and Core i3-6100 CPU to use the Oculus Rift, but those are just the minimum specs. 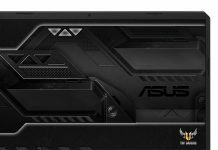 Systems that stick to that baseline rely heavily on warping to feed the headset’s 90Hz refresh rate. 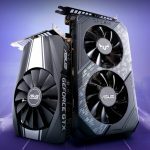 Oculus actually recommends a GTX 1060 paired with a Core i5-4590 or greater and at least 8GB of RAM. 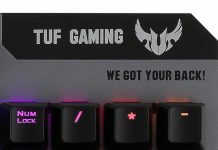 The GR8 II gaming desktop fits the bill with a GeForce GTX 1060 3GB GPU and up to a quad-core Intel Core i7-7700 CPU paired with 16GB of RAM. It’s also available with up to a 512GB SSD to ensure your apps and games load quickly. The really cool thing about the GR8 II is its size. 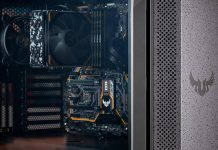 When you first take it out of the box, you may not realize the importance of squeezing all of those desktop components into a compact chassis the size of a console. But as soon as you embark on you VR adventure, you’ll realize that clearing enough physical space to play is one of the toughest challenges. 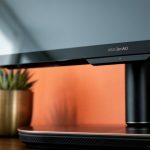 Beefy desktops take up a lot of real estate, but the GR8 II is small enough to place on your desk or in a home entertainment unit, where it won’t occupy valuable floor space and is out of harm’s way. 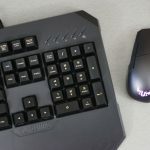 I didn’t think this was a big deal until I started experimenting with different games; I came close to hitting my couch and ottoman but never the GR8 II. 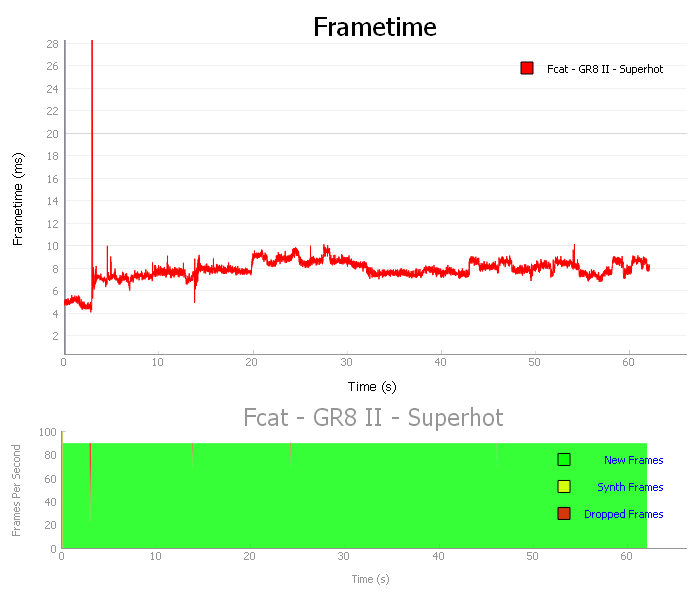 I put the GR8 II through its paces with a range of titles, from the relaxing and chill to intense and scary, and measured performance during 60-second sequences with NVIDIA’s FCAT VR utility. 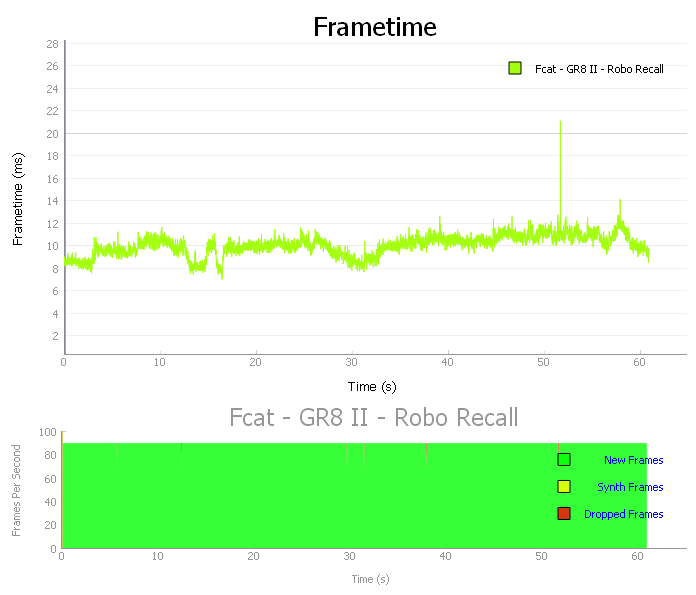 FCAT logged individual frame times in addition to the number of dropped and synthesized frames. While performance varied from game to game, the overall experience was fantastic. 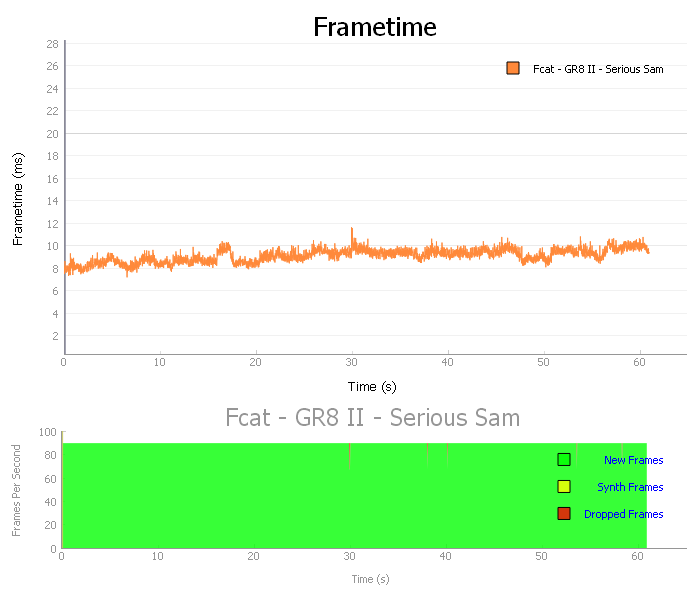 Here’s how the GR8 II fared. I wanted to start off with something I knew the GR8 II could handle, so I loaded Job Simulator. This game should be boring given the only objective is to perform banal tasks in what are usually considered the most mundane places to work. Instead, it introduces a level of hilarity by giving you free rein to carry out the tasks to your own spec. I decided to try being a line cook because I’ve never been blessed with the opportunity to work in a kitchen. Living out my dream of being a chef in Job Simulator‘s cramped kitchen was comical, if a little unrealistic. I was able to make a grape, bacon, and egg smoothie with no obvious judder during my testing, and I successfully finished a couple of orders of radioactive fried eggs and charred bacon. 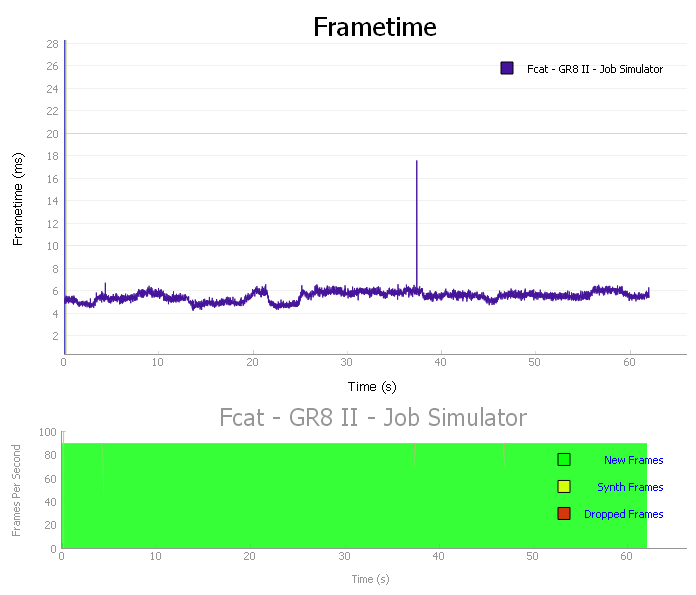 The chart above shows that the GR8 II handled Job Simulator perfectly, with no dropped or synthesized frames. Soup’s on (depending on your interpretation of soup). If you’ve got dreams of becoming a space pirate, you’re going to need to learn how to defend yourself against space robots. 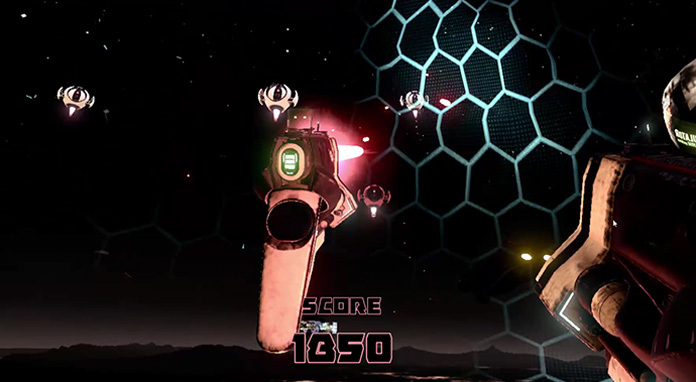 Space Pirate Trainer is a futuristic shooting game with a very simple concept: survive waves of flying robots. It looks deceptively easy at first. I started with basic pistols to take down a few little robots trying to end my budding career before it even began. Once I hit wave four, I was utilizing the shield, dodging shots in slo-mo, and shooting swarms with space machine guns. The further you progress, the more you’ll start to regret your choice of occupation. 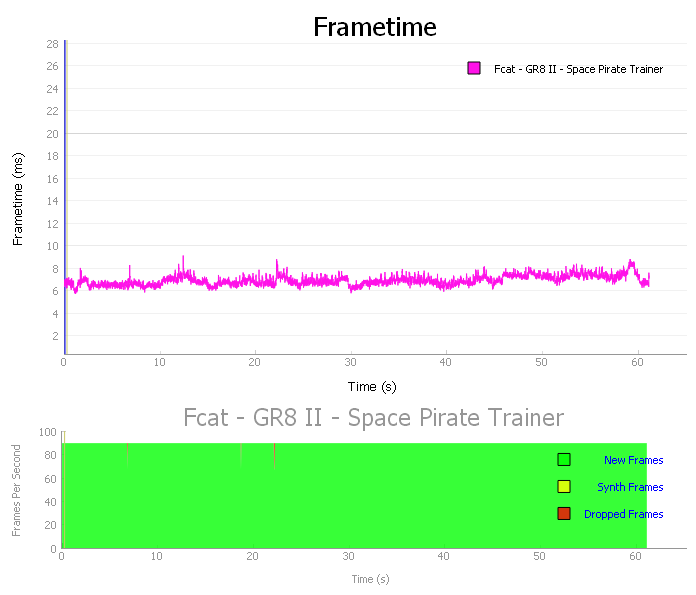 I’ll come clean and admit that I underestimated Space Pirate Trainer from the outset. As someone who has played a lot of arcade rail-shooters, like House of the Dead and Time Crisis, I thought this game would be child’s play. Boy, was I wrong. By the time I hit wave five, I was sweating and hiding under my shield like a coward, exhausted from contorting into weird positions to dodge incoming fire. 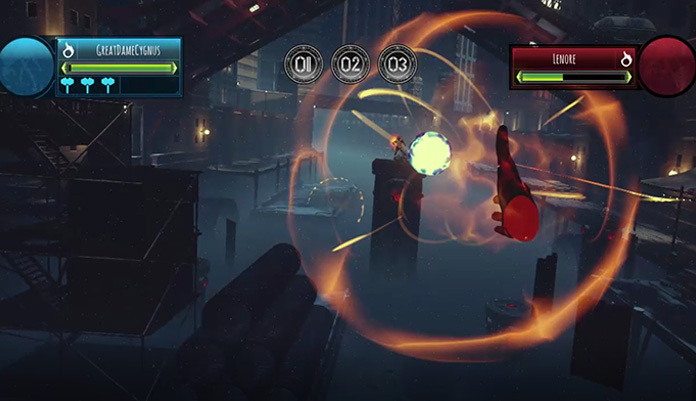 The gameplay is fast-paced and requires a lot of tracking and general movement, so some dropped frames are inevitable. However, because of how much I was dodging, firing, and moving around, I didn’t notice the occasional dropped frames. Fresh off my training as a space pirate, I exchanged pistols for magic powers and dove headfirst into The Unspoken. In this head-to-head spell-casting game, you spend most of your time conjuring up fireballs, knives, and other projectiles to throw at your opponent while you teleport throughout the stage to avoid getting attacked. Being active and staying alert is key in The Unspoken. During my testing, I went up against my in-game roommate Lenore, a skeletal raven who was still somewhat bitter about my besting him in the tutorial. It was time to show him that my first win wasn’t a fluke. There were apparently some blocks of synthesized frames during our epic battle of pyrotechnics, but because of how much was happening in the world around me, I was too distracted to pick up on them. How many of us can say that we’ve performed surgery with a hammer? 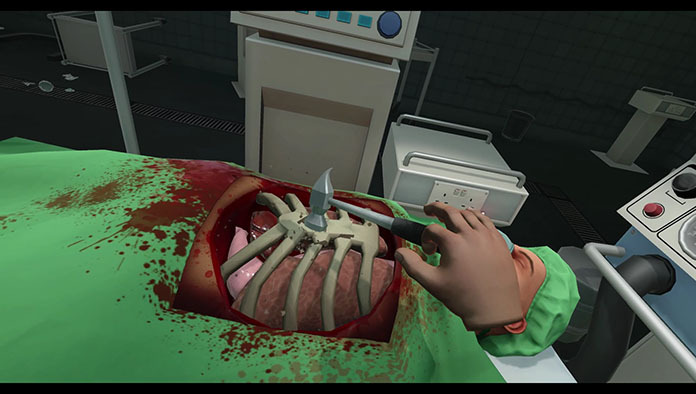 Surgeon Simulator allows you to step into the shoes of a doctor eager to operate on a plethora of patients. Your first steps into the surgical world involve giving a man a heart transplant. But, like Job Simulator, Surgeon Simulator doesn’t offer any instructions or specifics for how a task should be performed. After beating in the poor man’s ribs with a hammer, cutting through his intestines, stomach, and kidneys, and then accidentally dropping his new heart onto the floor, I knew I was in for a fun (if slightly frustrating) ride. In case it’s not clear by now, this game is very tongue-in-cheek. You’re not acting as a professional surgeon performing with the precision tools of the trade. Instead, you’re given an arsenal of everyday items to use as operating instruments while fulfilling your objective. When the game asked me to perform an eye surgery, I did so by replacing my patient’s eyeballs with two small, bouncy balls. I couldn’t help but giggle at the ridiculousness of it all, and I returned to the game after I was done testing. 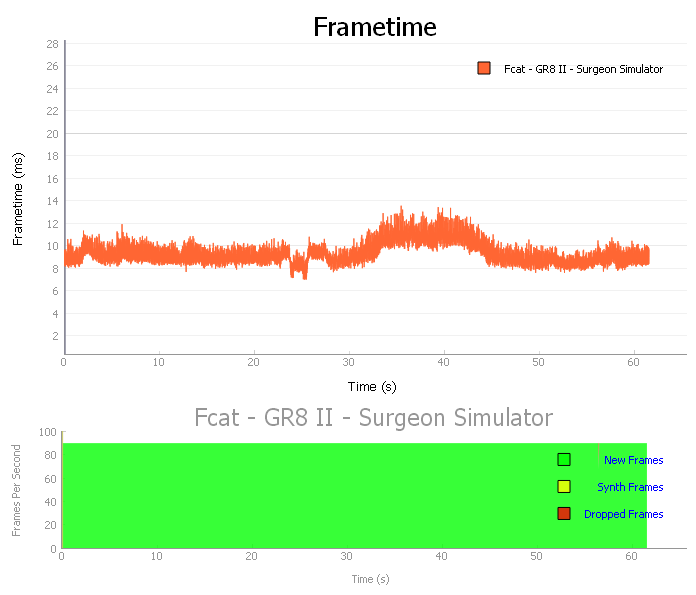 There were no dropped or synthesized frames during my time with Surgeon Simulator, which made the operating experience very smooth visually. 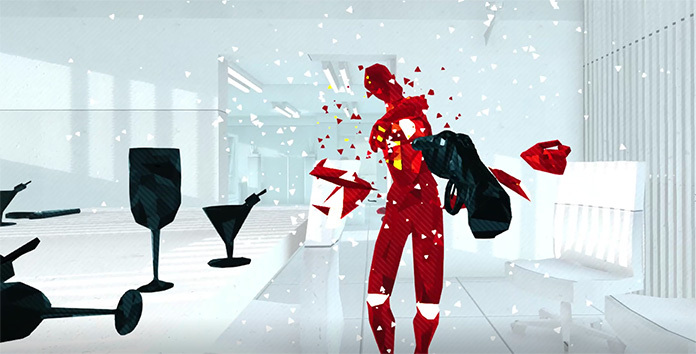 Superhot VR is one part first person shooter, one part puzzle game, and one part out-of-body experience, dishing out tense gun fights, strategic puzzles, and bizarre sensations in equal measure. It’s something that you have to play for yourself to really grasp—a sickly awesome experience where your movements and actions are everything. Time in the game moves only when you move your body, which encourages you to slow down and to think about each action carefully. If you step off the edge of a building, you won’t fall if you stay perfectly still. Your objective is to defeat all of the enemies in a given level without taking a single hit. Foes are usually equipped with firearms, but you only have what’s around you to defend yourself. That can include guns, but sometimes it’s just a vase or a frying pan. Success often comes down to mere seconds. In one level, I had no weapon and faced three opponents armed with shotguns. Each of them took a shot at me one-by-one, and I had to calculate how to twist my body to avoid all of their bullets. It took me a good seven tries to pass the level, and after I was done, I had to give my eyes (and my back) a break. Dropped frames occurred reliably when the game was loading, but because I was staring at a white screen while waiting for levels to render, there wasn’t anything to really notice. Occasional drops during gameplay weren’t noticeable, either; every movement looked and felt smooth, without any problems. 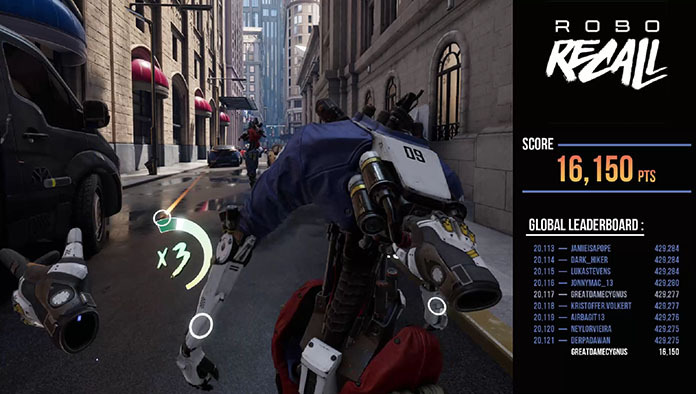 There is absolutely no wrong way to play Robo Recall. When you encounter enemies, you can choose to dodge and throw back the bullets they shoot, use your arsenal of guns to blow them to smithereens, or grab their mechanical collars and slam them into the ground. Trust me when I say there is nothing quite like beating the bolts out of a robot with its own arm. There’s never a dull moment in this game. At any given time, there can be a bunch of robots shooting at you from different angles. You have two choices: take them down with your smorgasbord of firepower, or try to stay out of harm’s way by dodging bullets. Fast reflexes and quick thinking are absolutely crucial in this game, and you never really have time to catch your breath. Similar to The Unspoken, there was so much going on in-game that there wasn’t really time to notice dropped frames. Based on the graphs and the section of the game I was benchmarking, the drops happened while I was distracted by a heated exchange with an enemy. During the few “quiet” times in the test, there were no obvious environmental discrepancies. I was able to happily roam the robot-ridden city, weapon in hand, with no interruptions to gameplay. 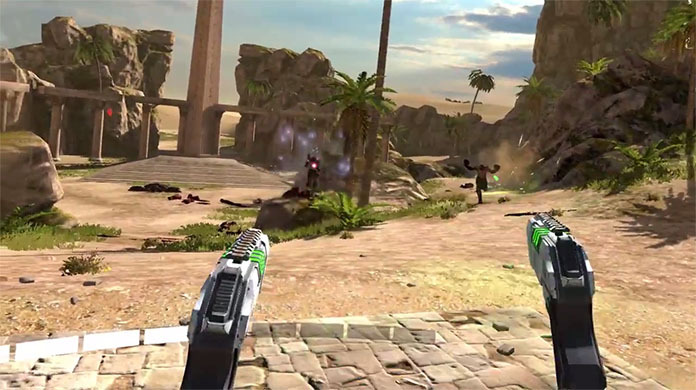 It’s usually pretty difficult to frighten me, but Serious Sam: The Last Hope did. This game not only kept me on my toes, but also legitimately freaked me out to the point where I abandoned the game, tearing off my headset and tossing the controllers aside. I started the first mission armed with two pistols, standing in the middle of what appeared to be ancient ruins. The area was absolutely stunning, with clear skies, beautifully rendered palm trees, and an earthy, picturesque landscape. But my peaceful reverie was shattered by a faint battle cry that gradually grew louder. It took me a second to register the grotesque Headless Kamikaze coming straight for me. I started to panic, screaming as I shot him down moments before he blew up in front of me. Then the real chaos began. Aerial monsters appeared from nowhere and threw projectiles, headless figures with rifles shot at me, and a rather terrifying creature with too many legs scuttled in my direction. For three minutes, I moved my head and body left and right, rapid-firing my pistol, and swearing loudly every time an enemy got too close. It wasn’t until the stage ended that I remembered I was wearing a headset, and none of what had happened was real. The combination of intense gameplay and complex graphics had me totally immersed, and Serious Sam drove my heart rate through the roof, reducing me to a sweaty, screaming mess. Luckily, nobody was home to hear me yelling in fright, and the neighbors apparently weren’t concerned enough to call the police. Unlike me, the GR8 II was able to hold it together; the system barely dropped any frames, producing a smooth visuals that no doubt contributed to my disturbingly real experience. Dimensions 3.46" x 11.77" x 11.07"
The harsh thing about VR is that, at the end of the day, none of it’s real. You take off your headset and realize, “Man, I couldn’t get away with the things I pulled in Robo Recall in real life.” But that’s the amazing thing, too. Virtual reality gives you a chance to have experiences that aren’t possible, and it has a bright future in allowing individuals to act out their fantasies and try new things without repercussion. You don’t have to be rich to lose your grasp on reality. 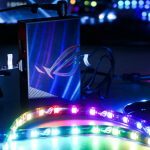 The ROG GR8 II provides enough power for VR without breaking the bank. 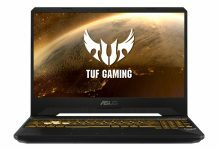 It delivered solid performance throughout hours of testing and smoothly rendered popular games with their default settings. Starting at $899 USD or $1,189 CAD for the Core i5-7400 configuration with 8GB of RAM and 1TB of HDD storage, the entry-level GR8 II-T044Z is perfect for those taking their first steps into virtual reality. For $999 USD or $1,319, you can double your RAM, and swap the HDD for a 512GB M.2 SSD. 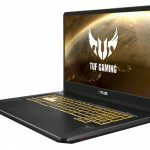 The top configuration ships with 16GB of RAM, a Core i7-7700 CPU that adds Hyper-Threading, a dual-drive combo with the 512GB SSD and 1TB HDD. It’s priced at $1,199 USD or $1,589 CAD. 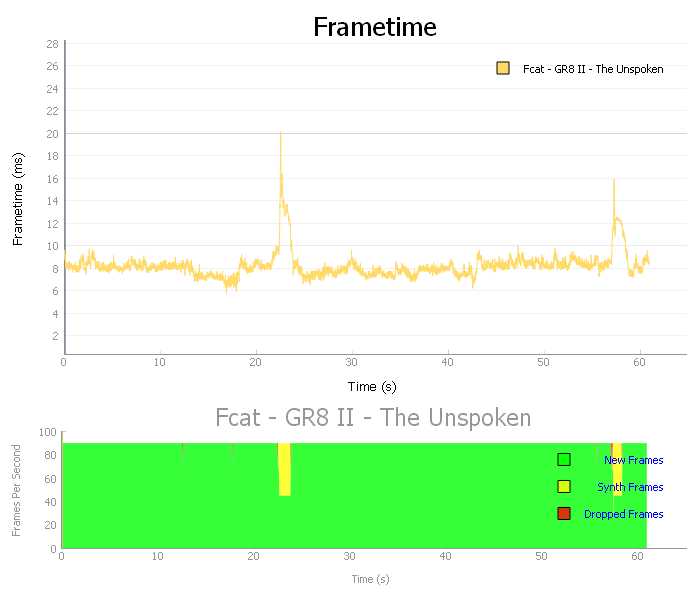 Check out the table above for retailers selling the GR8 II. 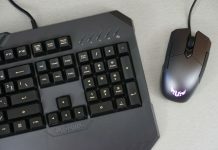 If you’re interested in seeing how the machine handles a more traditional gaming experience, you can read our hands-on look here.